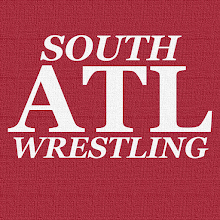 The South Atlanta Wrestling guys are very fired up for this one as it will take place at our high school alma mater, Sandy Creek HS. Also fired up about this one because it is shaping up to be a great show. AC Mack (c) v "The Captain" Shawn Dean - Cam Carter will be unable to appear so AC Mack will square off against "The Captain" Shawn Dean who has been really impressive the few times I've seen him. He's been in Tyrone before, and had one heck of a cool dive in that match. Hear from Shawn Dean, and see a little bit of what he can do on ACTION's Twitter page. As this will be a non-title match we now know that it will be AC Mack defending his ACTION Wrestling Championship against Fred Yehi at IWTV's Family Reunion! Bobby Flaco v Slim J - Slim J's new opponent is a guy with local connections, Bobby Flaco! He's out of the highly-regarded WWA4 school in ATL, and has made a big impression on the Tyrone crowd in ACTION. 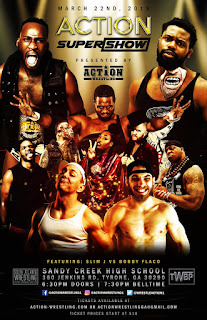 Bobby is coming off a BIG weekend where he opened up ACTION Wrestling 6 with a victory over an impressive Harry Zen, and the next night beat Sonico at the Scenic City Rumble in Chattanooga. Bobby is a guy who is really gaining momentum, and this is the kind of opportunity you love to see a guy like that get. As for his opponent, Slim J is every bit of a Georgia indie legend who is smooth as can be in the ring. This should be a real fun match for the crowd at Sandy Creek HS, and a REAL opportunity for Bobby Flaco to make an even bigger name for himself. Fred Yehi v Arik Royal -This one has been simmering for a while now, and Royal putting a $2,500 bounty on Fred's head at the last ACTION show certainly escalated it. Fan-favorite Fred is looking to a) end it once and for all, b) get some much needed retribution against Royal and c) build some momentum going into his Mania Week title shot against either AC Mack or Cam Carter. James Bandy v O'Shay Edwards - This one gives us the man I refer to as "ACTION's Hometown Hero" James Bandy taking on O'Shay Edwards. O'Shay is a rising name on the independent scene that has gathered a ton of momentum recently. He's also an absolute HOSS. Him and Bandy have been butting heads for a while now, and I have no doubt that the Tyrone crowd will rally behind James Bandy. He's been a guy that quickly was able to get the ACTION Wrestling fanbase energized, and they've really embraced him. It's another situation where you've got the perfect match up between a fiery face (Bandy) and a big, mean guy that has bad intentions (O'Shay). The Carnies v Jaden Newman/Cain Justice - In a match announced by The Wrestling Brethren Podcast, we have The Carnies returning to take on the upstart team of Cain Justice and Jaden Newman. Both Cain and Jaden are guys that are really becoming players on the scene, and they are taking on one of the most beloved acts in this region in The Carnies. It's going to be interesting to see how this new team works against the newly reformed, and rejuvenated Carnies squad. I saw this match referred to as a sleeper match of the night candidate yesterday, and I think it definitely has that potential. Also appearing...Aja Perera, and more! 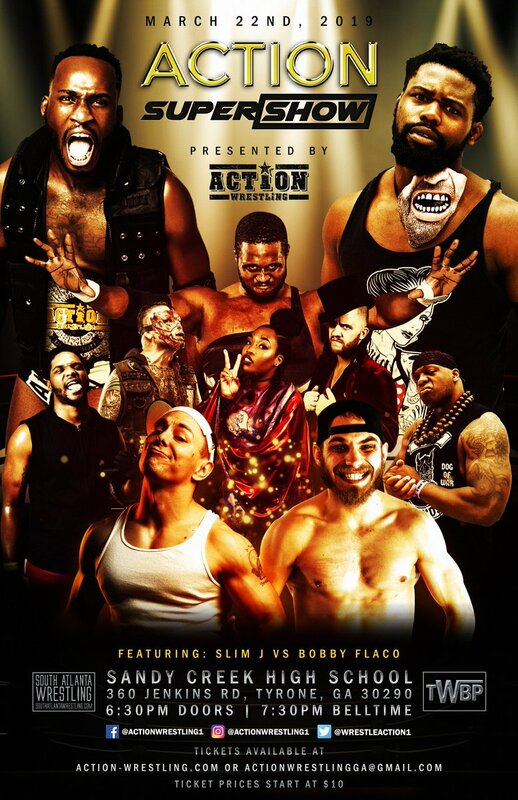 ACTION Wrestling 7 will benefit the Sandy Creek HS Band and Wrestling teams! It only costs $10 to get in the door, support a worthy cause, and witness some fantastic wrestling live!